See my wife in the photo? No? 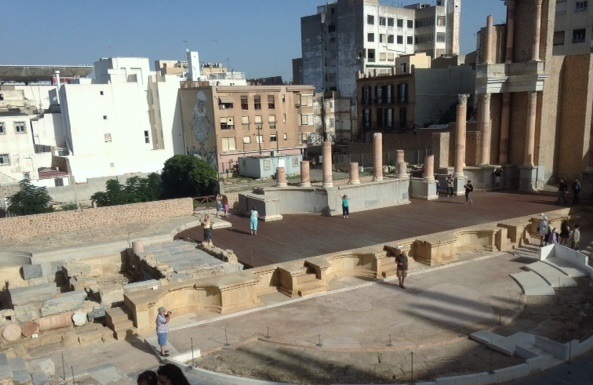 It was taken last fall at the ruins of a Roman stage in Cartagena, Spain. She’s right there center-stage, but I could barely see her and couldn’t hear a word. Such is the feeling I have right now. First, a commercial message I will explain later: My latest book is available in paperback and Kindle. You can get either by first clicking here. The explanation: Artists are notoriously bad at marketing. No secret there. So it’s no great surprise I made a serious tactical error when my latest book was released week before last. This became clear in the past 24 hours as several people asked if the book “The Reporter and the Sloth” was available. See the problem? These are people who obviously wanted the book but had not heard it was out. Man, this shyness problem of mine is killing me. Commercial break No. 2: Want to know a little more about the book? Click here. Seriously, I sometimes have to remind myself the overriding purpose of this blog is to give exposure to my books. I mean, this is my retirement plan. Sure, I want to write about all kinds of things and I will, but the book message must come up occasionally. Bear with me. Commercial break No. 3: This is my fourth book in the JP Weiscarver Mystery Series. Read more about each by clicking the “Steve’s Books” tab at the top. All are for sale through Amazon by clicking here. Also, your favorite book store should be able to order a paperback for you. And tell your friends. You can see I need the help.